Here are two versions of the same story ... presumably both adapted from one press-release ... from Summer 1972. The first is from the NME, the second is probably from the Melody Maker. 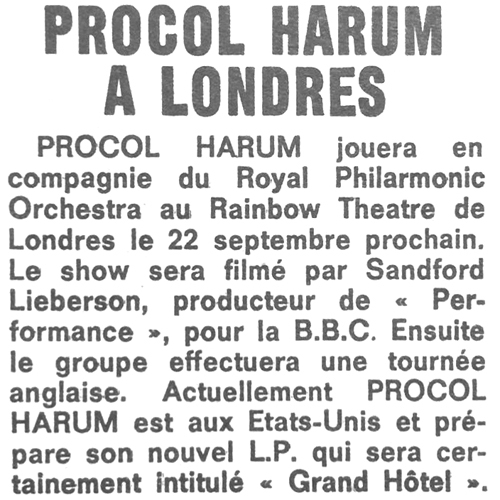 The differences of emphasis are interesting, as is the agreement to lead with news of the film of Procol's Rainbow gig ... a film which, to our knowledge, has not been shown on TV throughout the world, more's the pity. The third item is a promo piece from Canada's Rainbow magazine, 1972 (collection of Paul Wolfe), and the fourth is from Maxipop, published in France, August 1972. Procol Harum are to star at London's Rainbow Theatre on Friday, September 22, supported by the Royal Philharmonic Orchestra. And their concert will be filmed by producer Sandford Lieberson, who was previously responsible for the Mick Jagger film Performance. 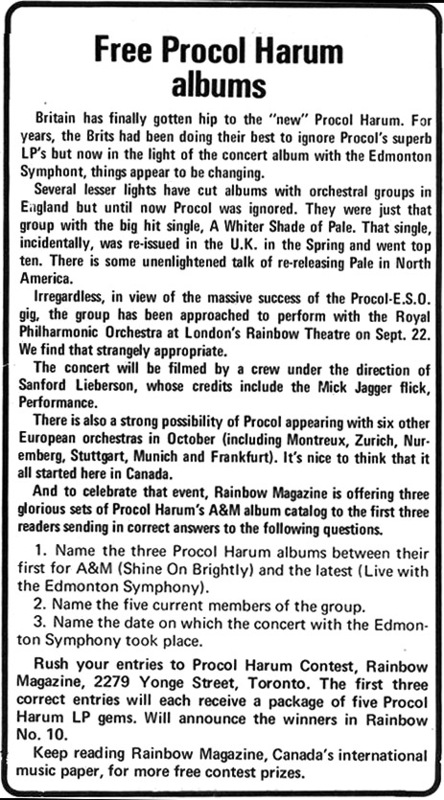 After the Rainbow date, Rainbow (sic – should of course read Procol Harum) play further dates – without orchestral accompaniment – at Bristol Colston Hall (September 23), Liverpool Stadium (24) and Newcastle City Hall (25), with the possibility of more British dates to be announced. On September 30, Procol fly to Montreux to begin a short tour of the Continent, when they will be supported by various leading European orchestras. The group return from their American tour this weekend, and spend next week completing work on their new album Grand Hotel for release by Chrysalis at the beginning of October. Procol Harum play London's Rainbow Theatre with the Royal Philharmonic Orchestra on September 22. This Rainbow date – the start of a British tour – will be filmed by producer Sandford Lieberson, who produced the Mick Jagger film, Performance. The film will be shown on TV throughout the world. The following day (23), Procol Harum play the Colston Hall, Bristol, then the Liverpool Stadium (24), and City Hall, Newcastle (25). More dates – about four or five – are being set between September 25 and 30, when Procol Harum fly out to Montreux. They follow with five dates in Germany. The band, who return from America this week, look like having their first hit single since their early days with Conquistador, taken from their live album with the Edmonton Symphony Orchestra, which has been Tony Blackburn's Record of the Week on Radio One. Already the single is No 17 in the US charts, while the live album, at No 5, is the group's most successful album. Procol return to the studios next week to start work on their next album, provisionally titled Grand Hotel. It is set for release at the beginning of October. is confirmed as Grand Hotel.